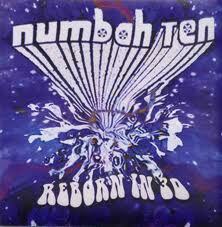 Numbah Ten - "Reborn in 3D"
Numbah Ten is a fantastic new trio from Sweden. They play mostly instrumental and spacey psychedelic stoner rock. I reviewed their Roadburn 2009 promo CD last year and all three of those tracks are also on this long 10 track over 75 minute CD. After a short intro the band kicks into Voice Inside, which is an uptempo melodic stoner track with a spacey vibe, which is something characteristic of the band in general. The melodic guitar lines are a bit like Monkey 3. Beyond the End starts slow and spacey before the down tuned stoner doom kicks in. I like the psychedelic elements with the delay vocals and spacey interludes. Another Day kicks things up a notch and begins with a very cool bass and guitar before the band takes off. All the songs on this CD are long, all over 7 minutes except two (both over 6!). This one has a bit of Kyuss like groove but then the band spend time spacing out in the middle before kicking into high gear and rocking out. Silent Cyclon is a spacey slide guitar instrumental that leads into the 14 minute, Come to the Light. As with most of the other tracks, the band takes a slow spacey intro before kicking into this headbanger, before slowing down and kicking into some killer lead guitar (some of the first you hear on the CD) that takes the track to a new level. Mirror of Time has a cool bass line and drum beat that the spacey guitar slowly builds upon as this track takes form. Power Flower is a change of pace and a stoned slower bluesy track to start and then even kicks into a reggae part which is really psychedelic and they stretch out a bit more with the guitar playing and it has a real 70s style rock ending. A Kindred Spirit is a more laid back track and features some guitar work as well. The CD ends with the 9½ minute track called The Spacemachine. This track is another heavy one with spaced out vocal and guitar parts and some great bass playing. I should say the bass playing is very good on the CD. This is pretty damn impressive debut CD that comes in a unique packaging.